Howe Sound scores 68 out of 100 for biodiversity; a score that combines an 80 for species and a 56 for habitats. A healthy ocean provides a diversity of healthy marine species, habitats, and landscapes. 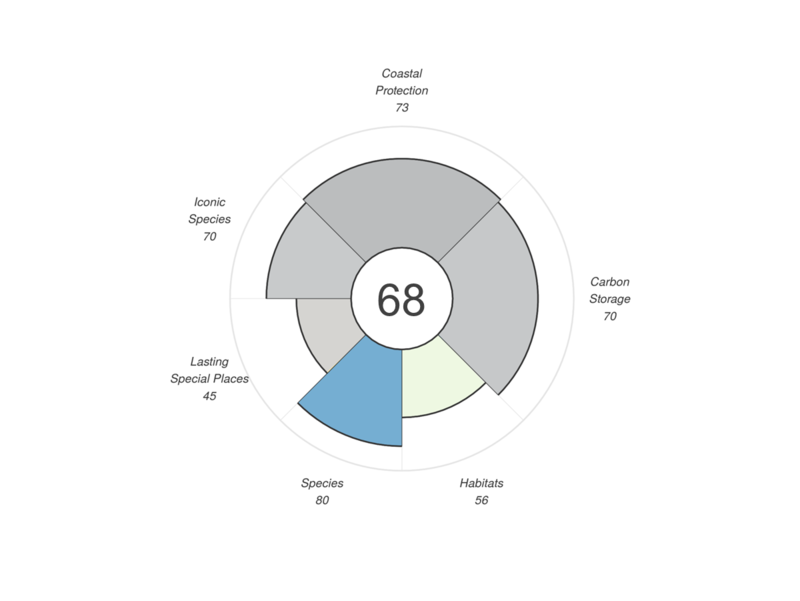 What can the Ocean Health Index tell us about biodiversity? Read about the Ocean Health Index and this report here. The OHI’s definition of biodiversity: A healthy ocean provides a diversity of healthy marine species, habitats, and landscapes. The OHI’s measurement of biodiversity: The OHI measured how well the ocean and coasts are providing biodiversity benefits in Howe Sound by measuring the condition of marine related species and marine related habitats around the Sound. To measure the status of Marine Related Species we assess the threat status of marine related species in Howe Sound. The Ocean Health Index team used local, regional, and global datasets to determine the conservation status of as many species as possible throughout the Howe Sound region. By using data across different groups of species, from tiny sea cucumbers to huge whales, we sought to get a clearer picture of how well all species are being conserved in the region and tell the whole story of the status of marine species Biodiversity. 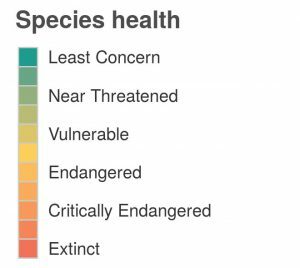 To achieve a perfect score, all species in Howe Sound should be listed as of “least concern,” meaning there is little risk of extinction. Ten species groups were included in this assessment (vertical bars). 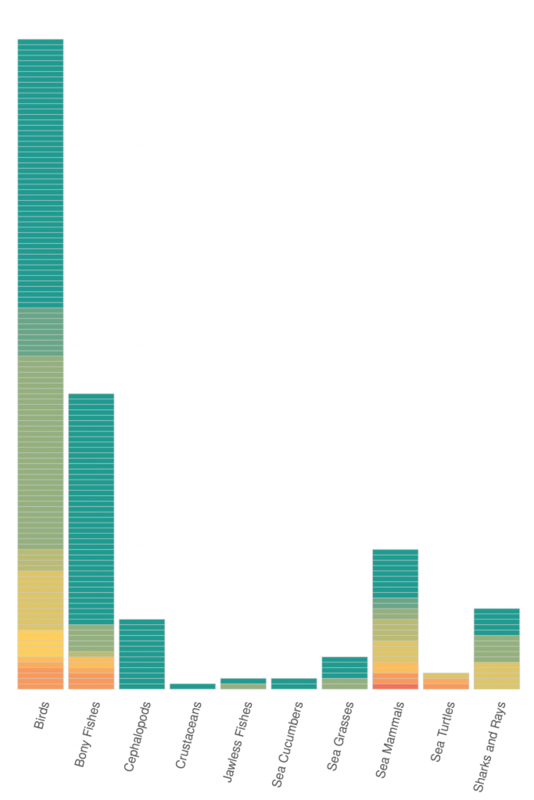 Each horizontal line in the vertical bars represents a marine related species and is coloured by its current conservation status. To measure the status of Marine Related Habitats we assess the threat status of marine related habitats in Howe Sound. To dig deeper into the status of Biodiversity in the region, we looked at the status of marine and coastal related habitats. We specifically focused on marine habitats that are known to have high biodiversity associated with them including salt marshes, sponge reefs, and soft-bottom habitats. Due to data and information limitations we were not able to include seagrasses in this calculation. By assessing how well these biodiverse habitats are being conserved we hope to capture more of the biodiversity status story in the region. We use these habitats as an estimate of not only the status of the habitats themselves, but also the status of all of the species that are associated with these habitats and use them for food, shelter, and other resources. If the habitats themselves are being well conserved, this is a good indication that the species that need these habitats for their own well-being are also being conserved. Salt Marshes: To assess the conservation status of salt marshes we used land-cover change data to look at how much saltmarsh has been lost in Howe Sound through time. Howe Sound is known to have lost ~30% of its salt marsh area before 1990 and we were able to use land-use change data to look in detail at how much has been lost since 1990. We used land-cover data for 2010 (last available year) and then included restoration efforts conducted since 2010 for our final calculations. This allowed us to look at net change in salt marsh coverage and we based our final calculations on these values. The target we used that would achieve a perfect score was zero net loss of salt marsh in Howe Sound. Sponge Reefs: To calculate the status of sponge reefs we used maps of where sponge reefs are known to be located throughout Howe Sound and then looked at how many of these reefs are protected from fishing pressure by closures. Because sponges are extremely long-lived species that grow quite slowly and are extremely sensitive to physical disturbances like trawling, we set a target of 100% of all known sponge reefs protected by fishing closures to achieve a perfect score. Soft-bottom Habitats: Soft-bottom habitats make up a large portion of the Sound. These habitats and the species that call them home are also quite sensitive to physical disturbances such as trawling. To calculate the status of this habitat we used maps of where soft bottom habitats occur throughout the Sound and then looked at where fishing pressures have occurred across this area. For this habitat, a perfect score could be achieved by no trawling occurring over any soft-bottom habitat areas.